Back in the 19th century some enterprising manufacturers devised pre-mixed oil pigments and portable easels. Enterprising artists carted these excellent supplies out into the wilds and began to paint light. They’ve been painting en plein air ever since. In the process they defined the way we dream about our country. Recently photographer Babs Young joined other artists for a plein air session at Loeb Farms in Charlevoix. 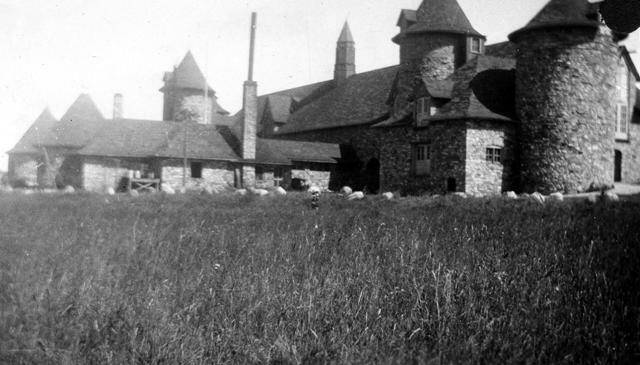 She writes: This magnificent structure was originally part of what is now called Castle Farms. Built in 1918 by Albert Loeb and designed by architect Arthur Heun, it is still owned by Loeb descendants and is used as a summer home. 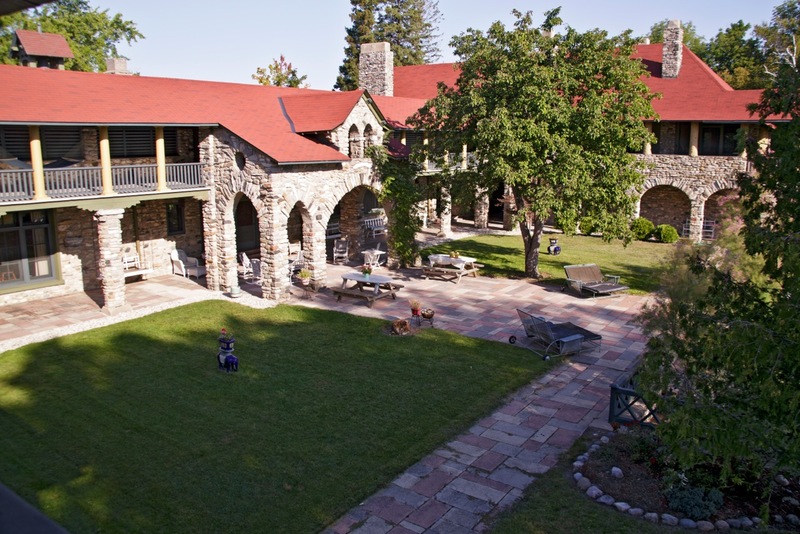 It appears to be almost the same as it was when originally built, and still has great views of Lake Charlevoix. This is the side that faces the lake. 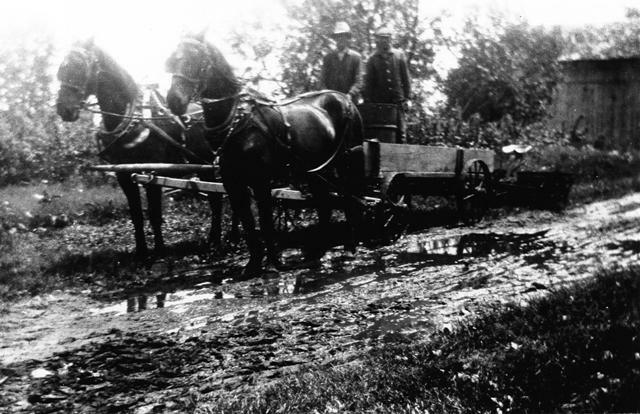 Loeb Farms operated all year round as a working dairy farm where progressive agricultural techniques could be tested. In its heyday it employed some 90 people. 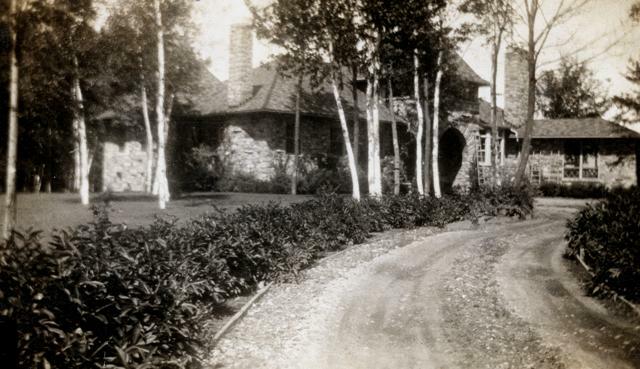 Coincidentally I have some vintage photos taken at the Loeb farm in the early 1920s. They were in a little photo album that found its way to Louan Lechler, who rescues orphaned family albums the way I rescue orphaned dogs. Now they’re in the digital photo archive at the Harsha House Museum in Charlevoix. I believe this is the smaller house on the estate, perhaps built as a guest house or a house for a farm manager. The farm was a living demonstration of the David Bradley farm implements sold through the Sears & Roebuck catalog. I will leave it to collectors of antique farm implements—and there are a fair number of them Around Here—to tell me whether that is, in fact, a Bradley. 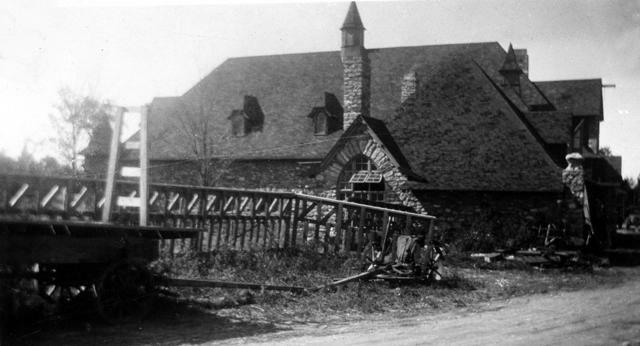 The impressive stone dairy barn was restored and incorporated into Castle Farms. 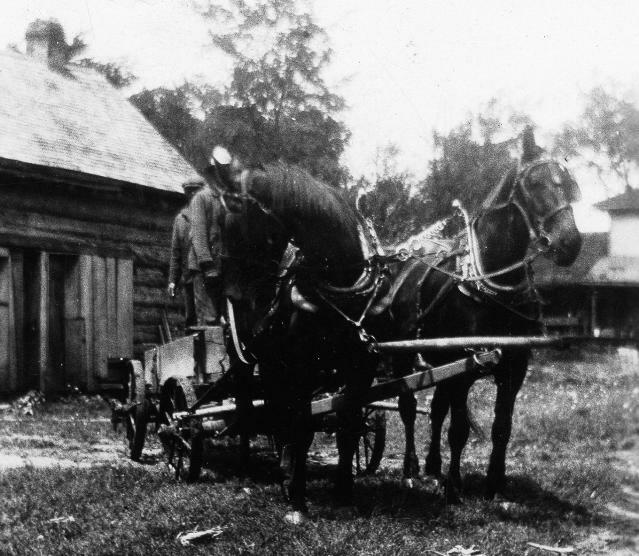 There was a horse barn, too, because modern implements aside, in the 1920s in northern Michigan, teams were the heart of agriculture. I want to remember that the 2007 PBS series Plein Air: Painting the American Landscape exists, so I’m tucking a link here. I’m glad you liked the post. It’s definitely a memorable place. I LOVE THE HORSE BARN AND THE HORSES!!!! Of course you do. I love them myself. They are magnificent. The barn’s pretty neat too. Lovely post Gerry. What a terrific thing that it has been maintained so nicely. Enjoyed the older photos you included. Thank you, Sybil. I am a fool for older photos. Loeb. It took a bit, but I finally connected it all: Albert-who-built-the-place also was the father of Richard Albert, who might have done better to stick to farming rather than joining up with Nathan Freudenthal Leopold and forevermore being known as one-half of Leopold and Loeb. Loeb, Jr., may have been at the time the youngest graduate of the University of Michigan, but he wasn’t quite as smart as he apparently considered himself. 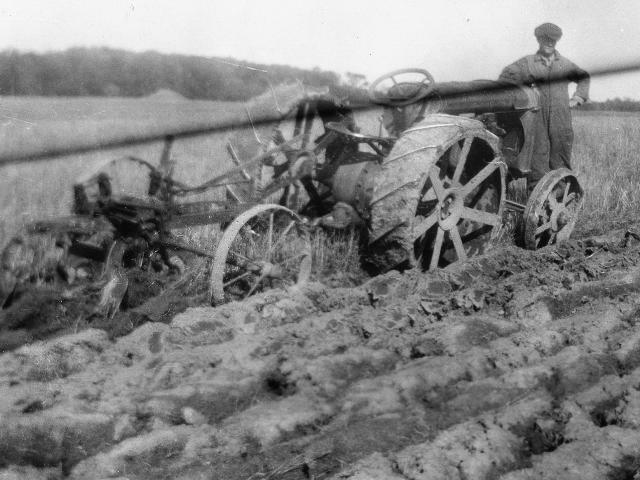 Interesting about the farm as a demonstration plot for the Bradley equipment sold through Sears. I see that Albert, Sr., was a VP at Sears – that probably helped to make the project possible. The photos are marvelous enough in themselves, but it does add a touch of – something – to think of that young man drifting around there on his way to a life of crime. He would have been thirteen when Castle Farms was built. He was eighteen when the Franks boy was murdered. Sometime in those five years he surely was at Castle Farms. So there we have it: me to you, to Babs, to Castle Farms, to Albert, Sr., to Richard Loeb, to Clarence Darrow! Who knew I had a connection to Clarence Darrow?! Oh, Richard spent a lot of time Around Here, demonstrating conclusively that neither a beautiful environment nor a life of privilege can protect against monstrous amorality. People worry about bears and bobcats–as we should–but perhaps we should pay more attention to the violent destructiveness of humans. Looks like a beautiful place. I’ve always had romantic notions about painting outside. The closest I’ve come is when we painted the house. Brown. sigh…. My house is brown, too, with moss here and there. The growth, not the color. Sigh.